It was back in July when former Orioles Executive Vice President Dan Duquette told the media the team would be more active in the international market. This decision was made largely in part due to the team’s horrendous 28-69 record at the All-Star Break and the need to rebuild the franchise from the ground up. In a conference call held shortly after Manny Machado was traded to the LA Dodgers, Duquette said, “You have to do a number of things well to compete in professional sports, but we had identified the areas that we needed to improve in – technology, international scouting, facilities, the draft, strengthening our analytics, investing in our international scouting, investing in more front office staff to be more in line with our competitors, expanding our nutrition and wellness resources at every level of the organization.” At last, a plan was laid out describing the direction the team was headed. Late in July, they traded Brad Brach, Darren O’Day and Kevin Gausman to the Atlanta Braves for Bonus Pool money, furthering their notion of being spenders in the International market. A few weeks later, the team began signing a wave of players from overseas, confirming their ambition. By the end of October, the Orioles had announced a total of nine players signed to contracts, totaling close to $1 million in money spent. The signed players included outfielders Damien Valdez, Issac Belmont, J’Rudjeanon Isenia, Kevin Infante and Angel Gomez. Infielders, Moises Ramirez and Gilbert Machado, and right-handed pitchers Carlos del Rosario and Kelvin LaRoche. At the end of October, it was widely speculated the team would make a push to sign Victor Victor Mesa and Victor Mesa Jr. Unfortunately, the Cuban-born brothers opted to sign with the Miami Marlins for $5.25MM and $1MM, respectively. The Orioles then focused their sights on 16-year-old flamethrower Sandy Gastón, but were unsuccessful in signing him as well. Gastón signed a $2.61MM deal with the Tampa Bay Rays, and within the span of a few days the Orioles had lost out on three international prospect that could improve the organization. They’re in good position right now, financially, to sign MLB.com’s cited fourth-best prospect, Yolbert Sanchez. On Tuesday, Sanchez became eligible to sign with Major League Baseball after defecting from Cuba to the Dominican Republic. Along with the Orioles, Sanchez has been scouted by the Houston Astros, St. Louis Cardinals and Texas Rangers, but a decision hasn’t been made yet on where or when he’ll sign a contract. With close to $6 million, the Orioles have more Bonus Pool money than any other team in the majors. They certainly have the financial advantage over anyone else to sign Sanchez. However, signing him may come down to if he could actually benefit the organization. An unnamed rival executive stated Sanchez was, “not a generational talent or anything,” due to his limited offensive potential. That comes from MLB.com reporter, Joe Trezza’s article on Sanchez which you can read here. “Known for his elite defense, Sanchez’s polished glove might be ready for the big leagues now. According to scouts, he can spray the ball from “line to line” and is considered a line-drive hitter. He ultimately projects to hit eight to 10 homers in the big leagues. He is also known for his average to slightly above average arm as well as an average to slightly above average running ability. Scouts also like his game instincts and track record. Sanchez was the starting shortstop for the Havana Industriales and projected to be the starting shortstop for the island’s national team before his defection last summer. He was the starting shortstop for Cuba’s 23U team in Panama and was a teammate of White Sox prospect Luis Robert on the country’s 18U team. Because of his age and experience, Sanchez will sign under the international signing guidelines. 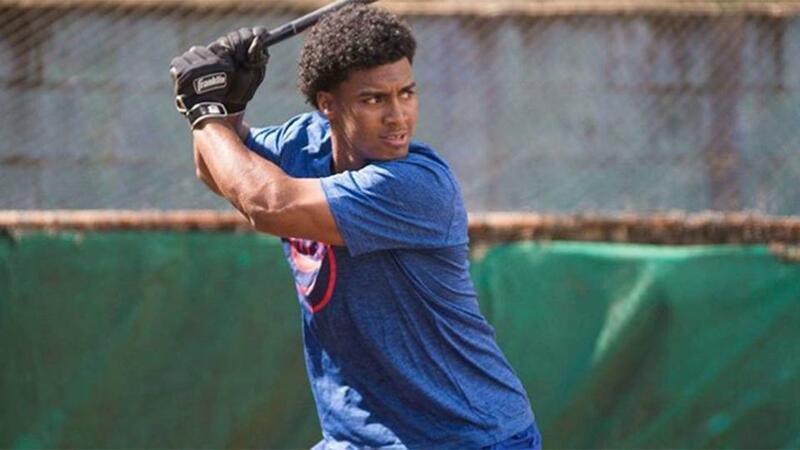 The Orioles, who came up short in their pursuit of Cuban outfielders Victor Victor Mesa and Victor Mesa Jr. and Cuban pitcher Sandy Gaston, still have close to $6 million in bonus pool money and were among the first teams to scout Sanchez in person. Should the Orioles decide to trade away their bonus money, the Twins, Brewers, Pirates, D-backs, Rockies, Indians, Royals, Tigers, Mariners, Blue Jays and Giants could be possible partners and thus be in a position to make a substantial offer. The Dodgers, Phillies, Rangers, Cubs and Red Sox have money to spend during the current signing period. The Astros, Mets, Cardinals and White Sox could be among the teams in play for Sanchez if he decides to wait until the next signing period that starts July 2. Keep in mind, if Sanchez does not sign with a team during this signing period, the Orioles’ financial edge disappears. Bonus Pool money is reset at the end of signing periods and General Manager Mike Elias has already said any unused money will be re-allocated in other ways to help improve the team. Is it time to give Cruz some rest?